Rahab is heartily condemned by many people because she dared to lie to save the lives of two men. Jael, on the hand, seems more acceptable because she did not commit to lying when Sisera asked her to lie [Jud. 4:20]. Actually, her reply is not recorded so we don’t know what she agreed to do. But we do know that all her actions toward Sisera were deceptions of her true intentions. She may never have had to lie with her lips, but her every action was a lie. Why is it that Rahab is usually criticized, but the deceptions of Jael usually escape criticism? Like the Pharisees, we often like to cling to the letter of the law. It is so easy to judge others who must make hard decisions in difficult situations. Nevertheless, the Word of God is the Word of God and we cannot compromise it. We are love-bound and duty-bound to follow it. However, we must make sure we are understanding it accurately. We have written on the ethics of Rahab’s lie elsewhere. Let’s take a moment to look at the deceptions of Jael. Was Jael right in what she did - using the art of deception, lying with her actions? Paul plainly says that we, as Christians, do not use trickery. When we examine the context, as all good Bible students must do, we see that he is referring specifically to how we present the Word of God. Unfortunately, many times the Word of God is presented with deception. For example, if we give people the impression that coming to Jesus will solve all their problems we are not giving them a true picture. Jael; however, was not in this situation. She was in a war zone and the enemy general came to her for help. It would appear from our historical Bible story that Jael offered her help. He ran to her tent because he had an alliance with her husband and she appeared to welcome the opportunity of assisting him. In fact, she was welcoming the opportunity of standing with the people of God and destroying their enemy. When we examine Bible stories of women in the Bible like Rahab, Jael, the Egyptian midwives [Ex. 1:15-21] and even the actions of God Himself [1 Kings 22:22-23, 2 These. 2:11-12], there appears to emerge an interesting principle. Before looking at the principle, we must make it very clear that the Bible requires honest communication in all forms in normal situations. Lying or deceptions are harshly condemned as things God hates [Pr. 6:16-17] when they are practiced against innocent people, for personal advantage or to hide our or others sins. It is not a tool to get out of trouble - deserved or not. What Jael was dealing with was not a normal situation. The principle that we see coming out in these type of extreme circumstances is that: Evil people who would use the truth for evil have forfeited their right to the truth. The truth about deceptions is that they are a legitimate weapon and defence in this narrow area. This allows for deceptions in times of war [but not slander - we can deceive our enemy but cannot exaggerate their actions or falsely accuse them] and trickery such as undercover police officers or undercover government agents may use [as long as they are against evil people and not innocent people]. It would also include things like an abused wife opening a secret bank account to save money to escape an evil man, churches helping those fleeing from injustice or people hiding those being persecuted from the persecutors [i.e. hiding Jews in WWII]. 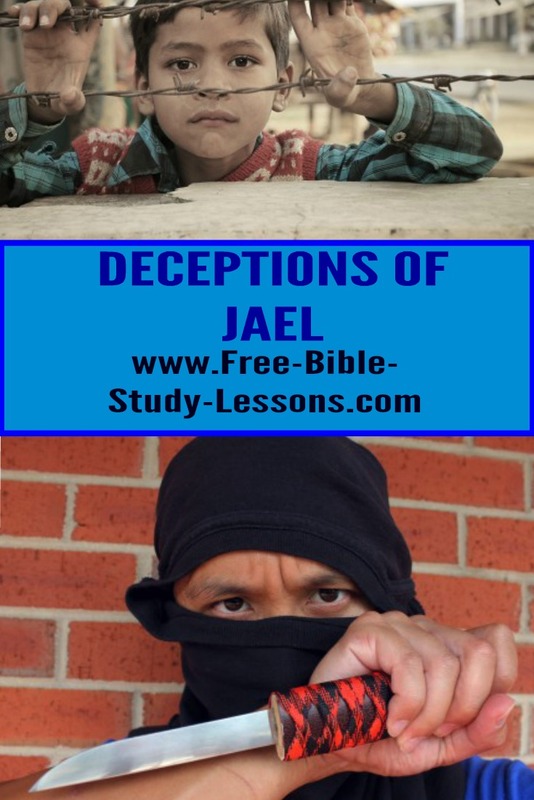 Jael shows us that in these special cases deceptions do not have to be defensive only like Rahab’s was. Rahab lied when confronted to protect those under her care. 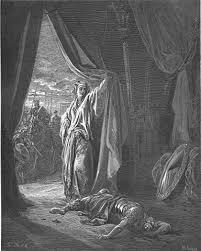 Jael actively went about deceiving Sisera. So both defensive and offensive acts are permissible in these limited circumstances. What does deception mean? A good definition is getting someone to believe without doubt something that is false. As mentioned in the truth about deceptions section above, this is ONLY legitimate when dealing with evil people bent on evil purposes. How was Jael able to so successfully trick Sisera to his death? She went out to met him confidently. Her every word, her every action told him she was on his side. She understood his problem, she had the solution and was glad to help. Any faltering in her voice, any sideward glances, any hesitancy in her actions would have betrayed her true intentions and probably gotten her killed. She did more than welcome him. She served him well. He wanted water, she gave him milk. He was tired, she covered him with a blanket which would not only warm him but give him an added sense of security at being hidden. She went out of her way to show him he was an honoured guest. Jael was careful to give Sisera no reason to doubt her loyalty and intentions. She did her job so well, that he felt secure enough to go to sleep in her presence. He trusted her. That is a good deception definition. Because Jael was successful a cruel oppressive enemy of God’s people was destroyed and she earned a place of honour in Scripture.